Lucy Joy Morris grew up in Berkshire, and as a keen violinist and singer studied at Berkshire Maestros and then the Junior Royal College of Music. She went on to study music at Queens’ College, Cambridge, where she was awarded the Beament prize for outstanding performance in her final year. In Cambridge, Lucy sang with Trinity College Choir, played the violin in several ensembles, and turned her hand to conducting after founding a mixed voice choir in her college. Lucy conducted the MagSoc Chorus and Symphony Orchestras in large-scale performances, and from 2013-2015 was a senior scholar on the Conducting Programme of Queens’ where she took part in a series of masterclasses, workshops and sessions with leading UK conducting tutors. In her final year, Lucy conducted the University Concert and Wind Orchestras as Cambridge University Musical Society’s Assistant Conductor, and she was Musical Director for the University Opera Society’s production of Bernstein’s Candide. 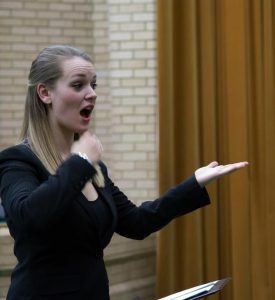 Since leaving university, in addition to conducting the Reading A440 Choir and the Reading Male Voice Choir, Lucy has developed a real passion for working with children’s and youth choirs. 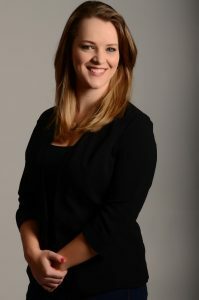 She continues to work as a conductor and sectional coach for the National Youth Choirs of Scotland and Great Britain, and currently conducts the award-winning Taplow Children’s and Boy’s Choirs. She is also currently conductor of the London Youth Choir Girls’ Choir. Lucy is a keen musical educator, holding the post of Director of Music at Holy Trinity School in Dartford. She holds the same position at Holy Trinity Church, conducting the semi-professional choir and young choristers. Lucy now receives regular conducting tuition from Neil Ferris, and has received masterclass and private tuition from John Dickson (USA), Peter Stark (RCM), Natalia Luis-Bassa (RCM), Peter Hanke (Denmark), Michael Reife (Germany), Sian Edwards (RAM), Tim Brown (Cambridge), Madeleine Venner (Hallé), Greg Beardsell (NYCGB), Amy Bebbington (ABCD) and Paul Brough (RAM).